After the wild goose chase I went on for the fat free ricotta in my Easy Cheese Lasagna review, I couldn't bear going around to all the stores in the area, so I made a couple substitutions. For some reason the grocery store I normally go to does not carry jars of pimiento, just pimiento with olives. So I went with that. I also used light Italian dressing instead of fat free. And was it green olives I was supposed to use? I hope so! Oh yeah, I forgot to steam the cauliflower (recipe fail???). So, was this recipe good? Or did I ruin it with my substitutions and mistakes? Even with the lack of clarity in the original recipe, my mistakes and substitutions, this salad was delicious. I see no need to steam the cauliflower if you leave it in the fridge overnight. I did use their suggestion of marinating it in the bag. That worked really well. Also, I quadrupled the recipe because I was planning on bringing it to a cookout. I'm not entirely sure how it went over with everyone. There was a lot left at the end of the party. This salad has a strong green olive taste, so I'm sure it's not everyone's cup of tea. If you like the flavor of green olives, as I do, you should give it a try. 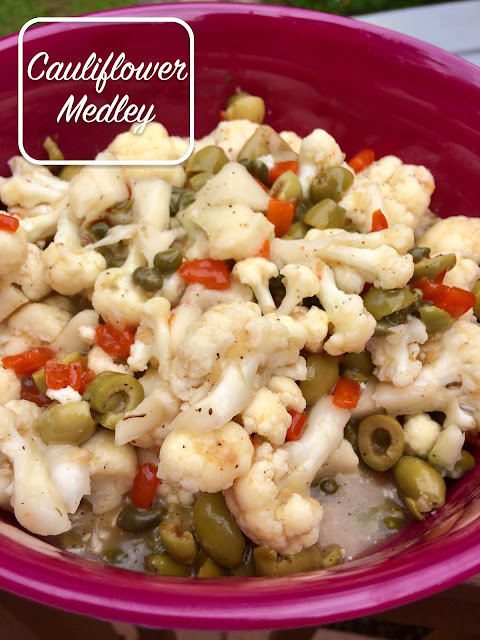 Cauliflower is a very nutritious vegetable and this is a great way to add it to your diet. Find the original recipe on page 6: 100 Favorite Weight Watchers Recipes. Steam cauliflower, covered, for 10 minutes (I was rushing, apparently, and forgot, DUH!) until tender. Do not let it get mushy. Place all ingredients in a large zip-lock bag. Mix gently and refrigerate at least 8 hours. Pour into a bowl and serve with a slotted spoon.